Similar to the cushioned Convert-A-Ball ballmounts with standard "bumper" towing, the Fifth Gear Fifth Airborne Replacement King Pins take the clanking and forceful jerks out of towing a fifth wheel trailer. The air-ride king pin uses an adjustable Firestone air bag and heavy-duty gas shock to absorb and control the shocks in the road. 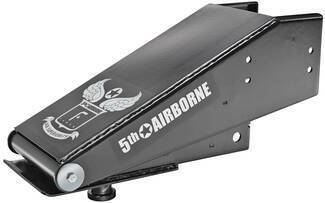 They reduce vertical shock (up and down) by 44.1 percent and longitudinal chucking (front to back) by 59.9 percent - Fifth Airborne is the only king pin on the market that reduces shocks in both directions! The reduction in shock between the truck and trailer offers increased safety, a smoother ride, and improved truck and trailer handling. 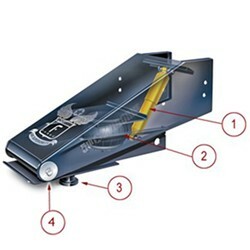 Reduced vibration is also easier not only on the truck and trailer contents, but on their frames. Trailer King Pin type - The Air-Ride couplers are custom designed to replace the standard king pins on trailers, so we'll need to find out the part number of the pin box (king pin) on the trailer. Most king pins will have the pinbox number on a sticker, or it will be stamped on the king pin itself. If it's worn away or missing, the customer will have to call the trailer manufacturer with their VIN or serial number to obtain the coupler type. Standard Schrader valves that are used are easily accessible on the Fifth Airborne Air-Ride coupler.